Beneath the mountain called Goblins’ Rock, the goblins have been mining for centuries. They have dug deeper and deeper. Their precious ore is running out and the taskmasters are getting BORED! So, in order to pass the time, the taskmasters have taken to racing their underlings into a... PIT OF FIRE! (Underlings are expendable, after all.) It is agreed that secretly choosing their favorites would be best and the race would end when the “winner” falls into the pit. Oh, and there should be gambling. You know, just to keep it interesting! 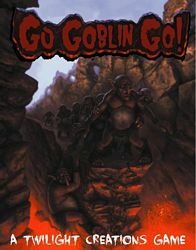 Go Goblin, Go is a light, standalone racing and gambling board game. You secretly pick three of the racing goblins and you get points based on where they finish. You manipulate their movement so you have some control over where they finish. Just don’t be first. The first goblin to fall into the pit “wins” but, they do not get any points.